Follow Your Dreams: Your Help Makes Dreams Come True! 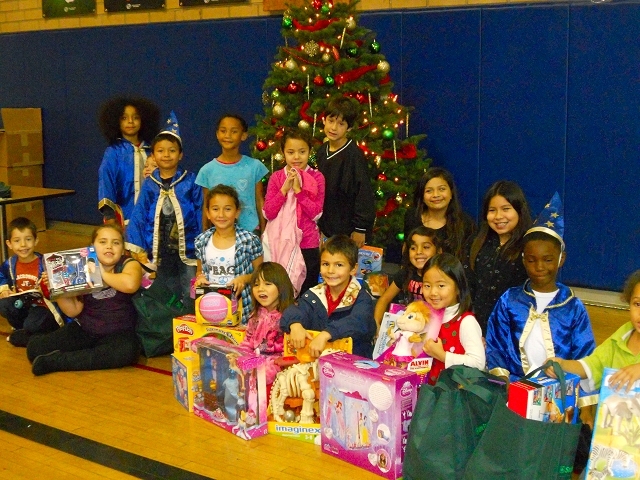 On this Day, Dec.11 the theme was giving back. 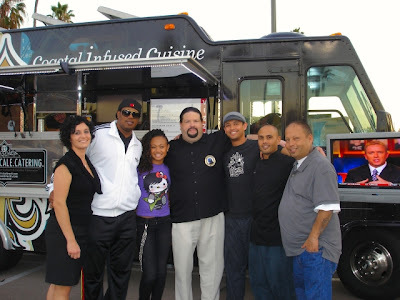 There was over 15 plus gourmet food trucks of various cuisines from great eatz to sweets along with a special appearance from P. Miller and his lovely daughter Cymphonique Miller whose charities include Urban born. This event was about food trucks raising awareness about children who might not have a Christmas with the joy of opening presents. 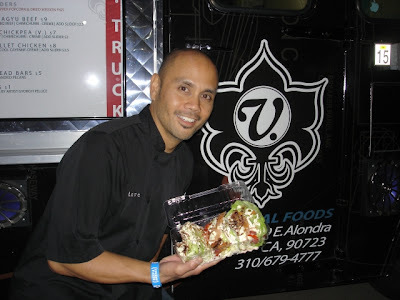 Eric Nakata of the Japanese-Peruvian fusion truck Lomo Arigato was able to use his contact with P. Miller and his close relationship with Vizzi truck to put on this great event about giving back to less fortunate children through their charity The Boys and Girls Club of San Pedro. 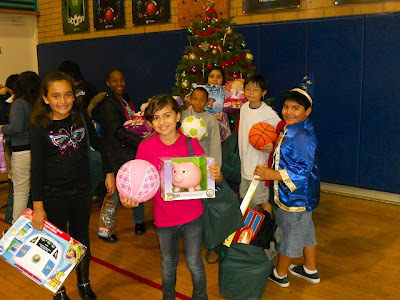 See awesome pics of kids with gifts. 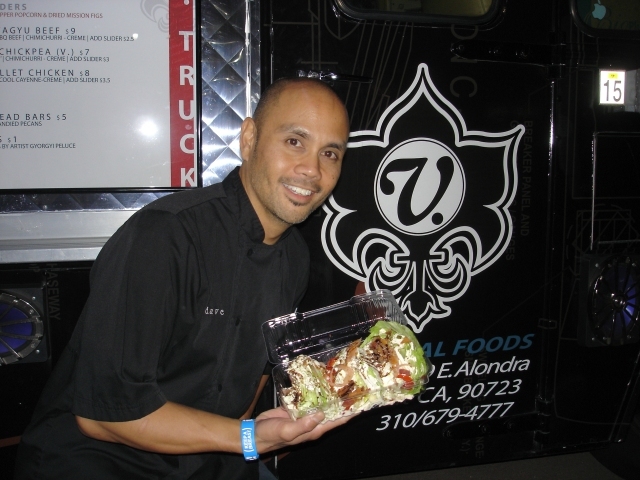 Chef Dave Fune of the Vizzi truck showing off their awesome new menu item the Wedge’ Salad: Made with black chimichurri dressing, bacon, pickled onion, winter tomato, and bleu cheese. Two thumbs up! 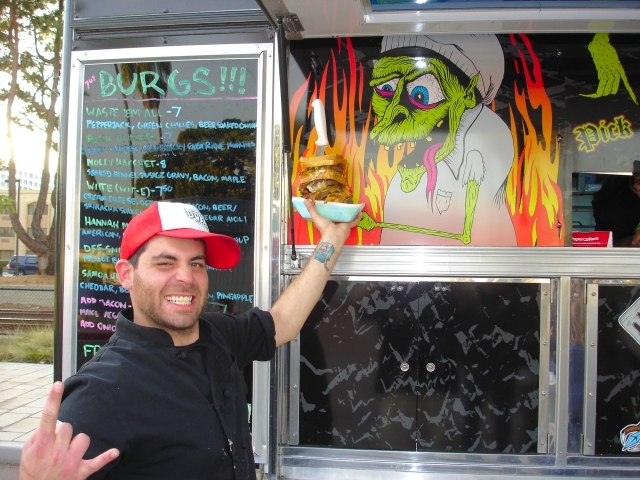 Ryan Harkins from Grill Em All truck who made this awesome Quin-Behemoth for Big Tony Ragu, which was given to a fan. The Quin-Behemoth: Made with 5 grilled cheese sandwiches, 5 1/3 lb delicious 80%/20% ground beef chuck burgers, 15 pieces of apple wood smoked bacon, 1/2 lb beer soaked onions, and 5 thick slices of smoked cheddar. Awesome! 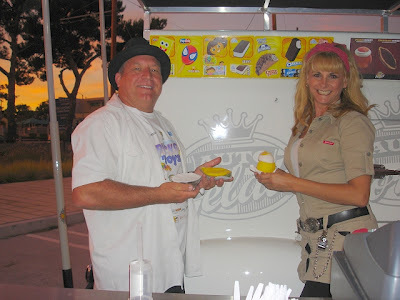 Auto Creamery owners Boyd and Debbie displaying their fresh fruit ices, which are made in their original fruit shells; some of the flavors include coconut, mango, and lemon. Sweet and Refreshing treat! 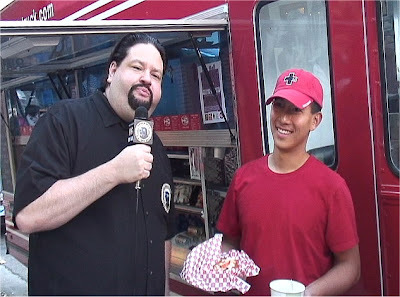 Big Tony Ragu and P. Miller (Aka Ice Cream Man) of BBTV talking about his relating to the gourmet food trucks entrepreneurship as a parallel to his own life. Urban Born a charity which is near and dear to his heart, provides workshops and programs, teaching positive life and career skills. Their motto: “It’s Easier To Catch On Now, Than To Catch Up Later.” Additionally, P. Miller's daughter Cymphonique has a big heart for a 14 y/o. She is a great supporter of Urban Born and assisted in helping on this event. You can hear her new single "Follow Your Dreams" on their website as well on the video below during the credits at the end. She is a rising new star with a new show out on Nickelodeon in 2011. P. Miller and Cymphonique Miller have proven that giving back is what it's all about. Thank you! 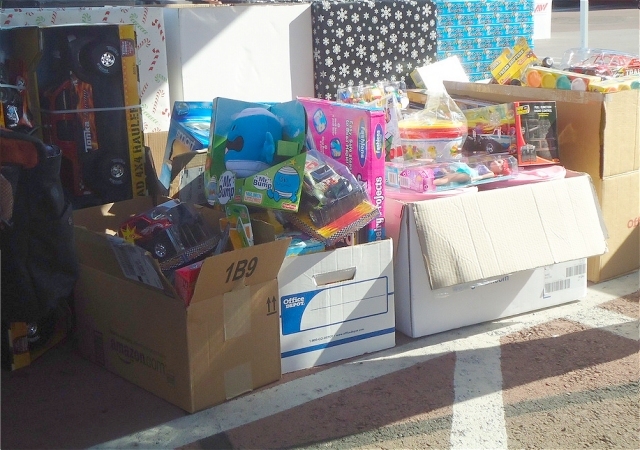 This picture depicts some of the 700+ toys raised by the Truck N' Toys drive on Dec.11th by food truck fans and food truck operators. The toys were divided up between the Urban Born Charity supported by the Millers. 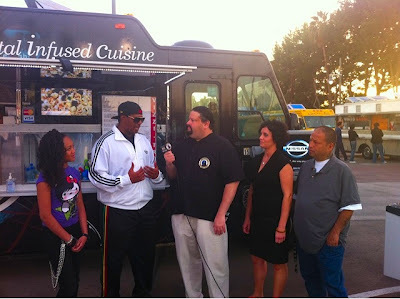 The other charity was The Boys and Girls Club of San Pedro supported by the gourmet food trucks and Glenn. Big thanks to Danielle Struwe, Vizzi truck team, and Eric Nakata from Lomo Arigato for having big hearts to start a wonderful event of giving back and inviting me out to share this story. Thanks to Leomar Ignacio who is the Middle School Volunteer Coordinator from the Los Angeles Harbor Boys and Girls Club of San Pedro for sending me this awesome photo of the younger children enjoying their presents, which was donated by the Truck N' Toys event on Dec.11th. Nice to see smiling faces. Great Job! Thanks to Leomar Ignacio from the Los Angeles Harbor Boys and Girls Club of San Pedro for sending me this photo from the 11-Up age group included in the festivities. You can see the joy on their faces. The Marvel Vs Capcom 3 event brought to you by the creative team at SA Studios Global whose lead by 2 of the most creative artists in the industry Mister Cartoon and Estevan Oriol, Capcom USA, and Marvel Characters, Inc was jam packed with gamers from all over California and abroad. Some even stood on line outside the Kim Sing Theatre in Los Angeles from 10:00 PM the previous day just to get a chance to play what looks to be one of the hot new games out for PS3 and 360 gaming consoles, which is due out February 2011. 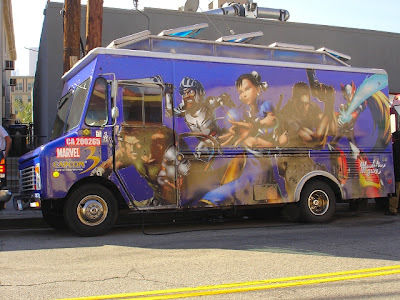 Special thanks to Patrick from LA Street Food App, Emily Shen from SA Studios Global, Melody Pseiffer of Capcom, and Marvel Characters, Inc, and all other contributors not mentioned. Awesome Event! The Event was the proving ground for 2 awesome chefs, Eric Greenspan and Ludo Lefebvre to battle their culinary expertise in creating an inspired dish by the gaming company that they were selected to have a knock down and drag out Food Fight in two of LA's hottest food trucks. 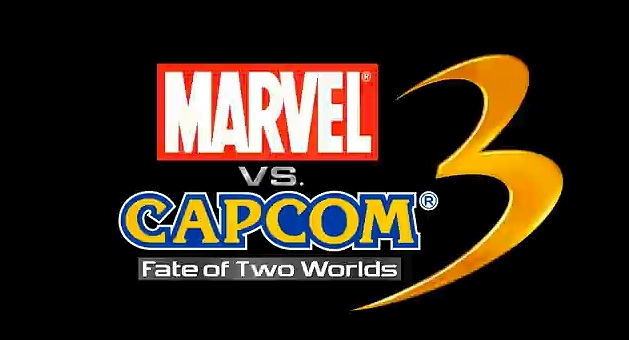 Enjoy Capcom and SA Studios interviews. 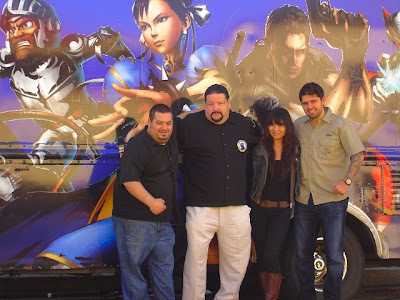 Capcom truck aka Mandoline Grill Vietnamese inspired truck owned by Mong Skillman. The Capcom wrapped Mandoline Grill Vietnamese inspired truck owned by Mong Skillman was represented by Chef Eric Greenspan who owns The Foundry on Melrose and defeated Iron Chef Bobby Flay on Iron Chef TV show. Chef Greeny his twitter handle created his dish inspired by the Capcom's Ryu Character's special defense weapon by naming it the Ryu FireBall! It was created with Asian flavors in mind; served in a chewy grilled pork bao bun, thinly sliced soft pink Ahi tuna, crunchy cabbage, with a spicy sriracha miso-mayo dressing, and top off with lovely pork cracklings. 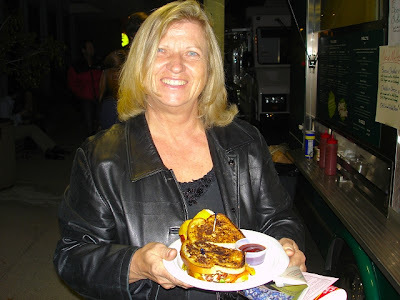 I think I heard the heavens open as I took my first bite, off the hook! See interview and pic below. 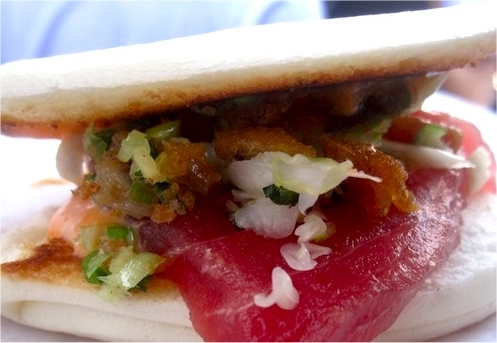 Served in a chewy grilled pork bao bun, thinly sliced soft pink Ahi tuna, crunchy cabbage, with a spicy sriracha miso-mayo dressing, and top off with lovely pork cracklings.WOW! Nuf said. 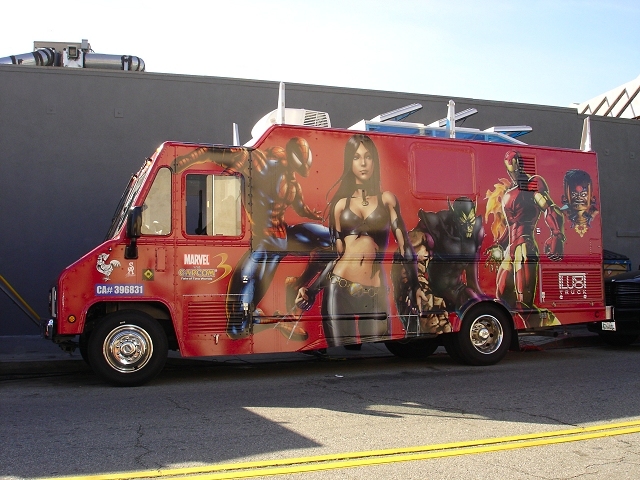 The challenger Marvel truck of Chef Ludo's small bites inspiration. The challenger of the Marvel truck was Chef Ludo Lefebvre's small bites inspiration represented by who else, Chef Ludo himself, but of course! 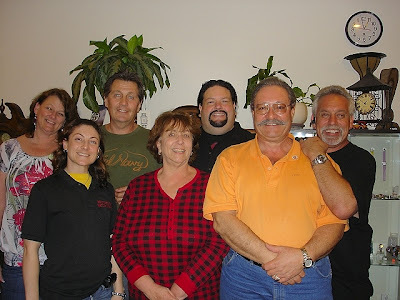 Chef Ludo's inspiration was Marvel's famed Hulk character. The inspiration was green and bold. 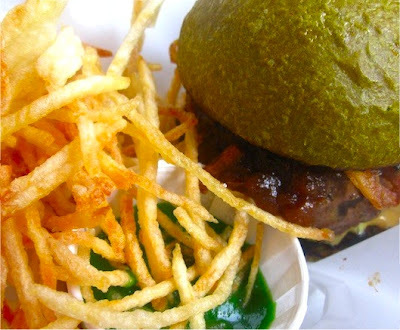 Chef Ludo used 3 types of meat; sirloin, chuck, and brisket, along with stuffing his burger with Velveeta cheese to create his own "Juicy Lucy" version inspired by a Minnesota based eatery called Matt's Bar, served on a potato spinach infused brioche bun, homemade onion jam, green tomato that created a radioactive colored gourmet ketchup, and fried onion strings to top off a juicy and delicious Hulk inspired burger with a side of delicately seasoned pomme paille (Shoe String Potatoes). See video interview and pic below. 3 types of meat; sirloin, chuck, and brisket, along with stuffing his burger with Velveeta cheese to create his own "Juicy Lucy" version inspired by a Minnesota based eatery called Matt's Bar, served on a potato spinach infused brioche bun, homemade onion jam, green tomato that created a radioactive colored gourmet ketchup, and fried onion strings to top off a juicy and delicious Hulk inspired burger with a side of delicately seasoned pomme paille (Shoe String Potatoes). Chef Ludo pulled it out and won. I say REMATCH! The event named Less Mall More Melrose was the brain child of Keith Manship who brought in Patrick Green of LA Street Food App, who asked Big Tony Ragu to help promote this cool event. Keith manages a cool and trendy foot wear store at 7475 Melrose Ave named John Fluevog shoes decided to get his felow merchants involved by putting on this event. Keith is a founding member of MAMA (Melrose Avenue Merchant Alliance), a group of business owners and operators that are on the original Melrose Ave.between Fairfax and La Brea. They have teamed up to put on cross promotional events like the Less Mall More Melrose event. Please enjoy the upfront interview with Keith and Patrick. The Willoughby Road chefs are very creative with their Memphis/North Carolina inspired menu adding a kick of heat mixed with apple cider vinegar to give any BBQ lover a lip smacking good time! 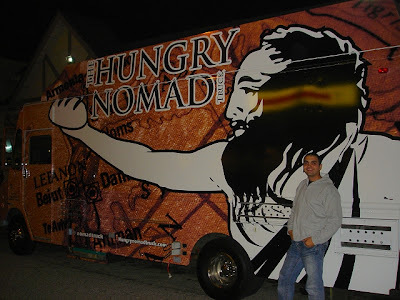 We will be seeing this gourmet food truck again soon as we meet the second half of this awesome team Chef Luke Reyes. 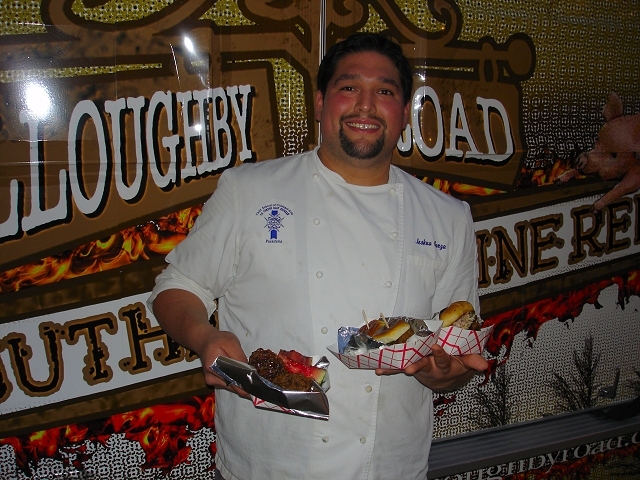 Enjoy the interview with Willoughby Road BBQ truck and the tasty BBQ creations we sampled. 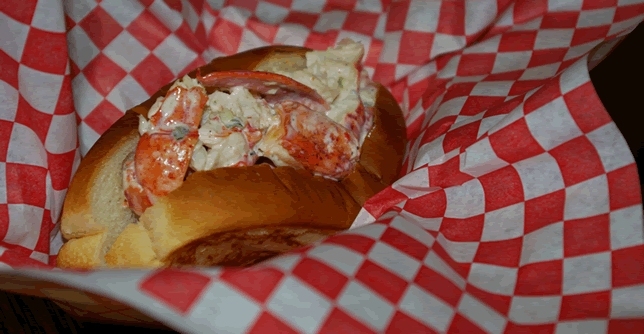 Maine lobster with the original split, top buttered sandwich roll from New England. Authentic ME. Amazing! The Lobsta truck is new to the LA scence with a promise to be authentic from the sweet and soft Maine lobster down to the New England original split, top bread, which they add butter or mayo to your liking. Other menu items are their creamy New England chowder that has plenty of clam and potato chunks to fill any foodies belly to satisfaction. The ME Crab was not available, but we will back soon. Enjoy their interview. 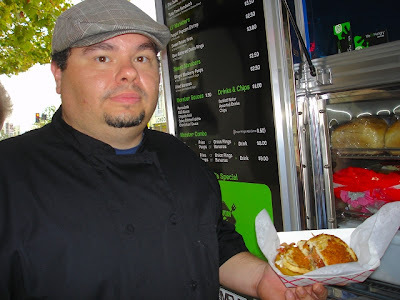 Chef Cory Ewing from the Me So Hungry food truck with their signature menu item The Duke! Awesome sandwich! Chef Cory is trained from Le Cordon Bleu. He has a passion for his food and it shows in the wonderful creations we sampled at his gourmet food truck. Their signature sandwich the Duke combines an 80/20 ratio of delicious sirloin beef that is well seasoned, crispy bermuda onion rings, sweet coleslaw, with their homemade BBQ sauce, bacon, on a rustic cheese bread, their hoisin marinated short ribs, delicate and buttery pepper jack cheese, crispy bermuda onions and spicy crème fraîche, along with off the hook crispy sweet potato fries with a spicy crème fraîche. Enjoy their video interview with a close look at their yummiest food. Big Tony Ragu (LF) Liwei Liao (RT) co owner of the Boba truck created a special Chinese Osmanthus Flower Tea (Chinese Osmanthus is a major ingredient in Jean Patou's "1000", the world's most expensive perfume.) for me to try out. Simply TEA-licious! 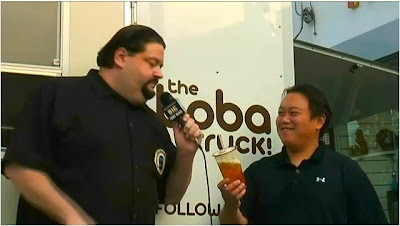 Liwei Liao and Michael Tsuan the Boba truck are capable of making over 60 combination of Tea. Each time made fresh to order in a special steeping machine that uses high grade filtering to deliver one delicous cup of tea. We have been to the Boba truck many times and have had more than 15 combination so far. They have even named a tea after me. You will hear more on that when we go behind the scenes with this incredible truck on Sunday Dec 12th at the Korea Daily's Holiday Charity Festival. Where the Spirit of Community lives! 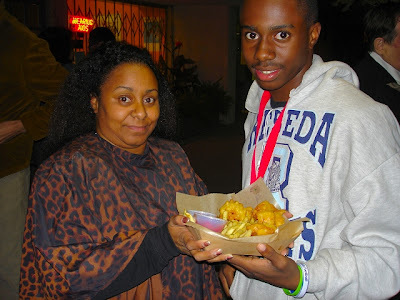 Its was on December 1st when Patrica Lyon of Westchester Watch Works a merchant for 21+ years and a community leader had an idea of breathing fresh air into a lackluster showing she had experienced at the usual First Fridays events in Westchester. 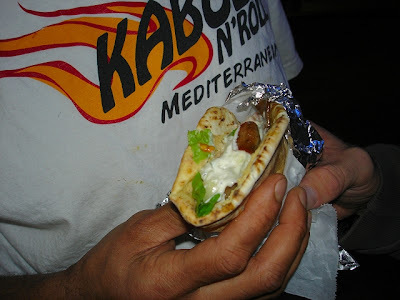 Pat contacted Sheldon Katz of No Reservation Catering, a gourmet food truck owner and friend, who then contacted myself, Big Tony Ragu to help organize and promote a First Friday's event in 3 days. 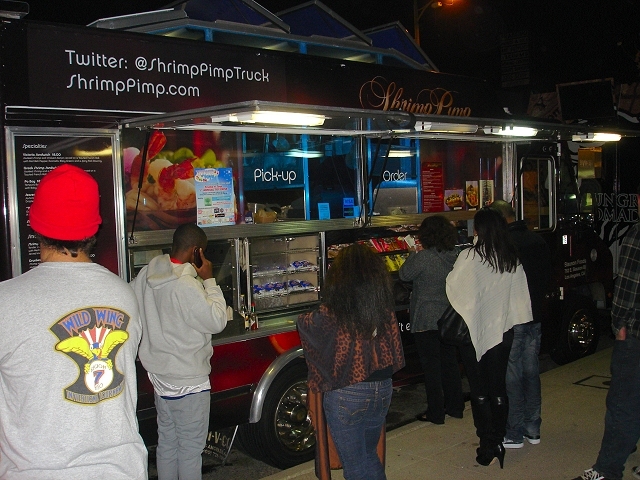 Patrons waiting at the Shrimp Pimp truck as First Fridays begins. Awesome salmon and shrimp! The Westchester First Fridays event was born on December 3rd and began in the 87th St. Merchants Group area of 87th West Street and Truxton became the home for a family inspired event that included 12 gourmet food trucks being embraced by 1500 plus patrons that strolled the quaint grounds that day. There was plenty of parking, friendly shop owners, and kids of all ages just enjoying the gourmet food truck vibe. The new family friendly standard will be added to future events conceived by Westchester First Fridays Organizers. Stay tuned for new great events coming with more food trucks along with new locations, which will share the same vibe we brought to Westchester. 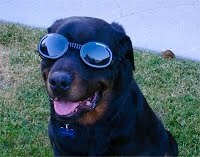 Lets face it, California fans deserve it. Enjoy the video interviews of the Westchester First Fridays event and pics taken that day. Thanks to all our supporters, food trucks that attended, and Westchester Merchants. Check out our Yelp review. Big Tony Ragu w/a fan enjoying the Beorek from the Hungry Nomad truck. Delish! Shrimp Pimp fans enjoying the Shrimp'NChips. Looks Great! Another Happy fan enjoying a Tuna melt from Greenz on Wheelz. Yum! 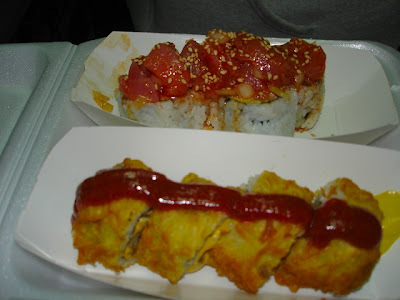 Yatta, All American-Cheeseburger and Poki-Tuna rolls were Amazing! 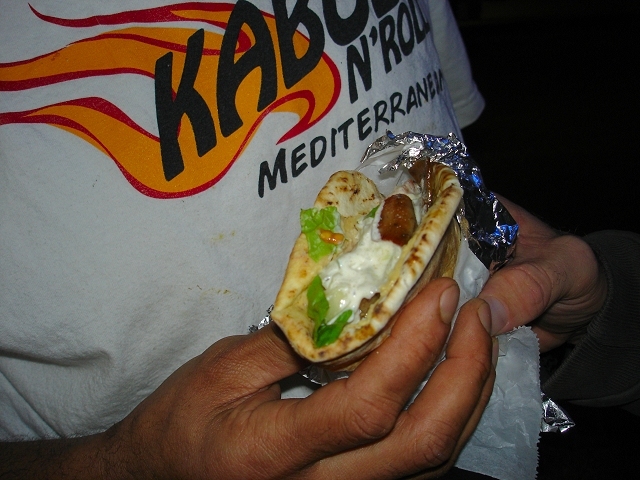 Kabob N' Roll's Lamb Gyro was outstanding with a well seasoned yogurt dressing. Cassandra and Rachel of Sugar Babies displaying their PB&J mini cupcakes. Sold Out in 3 hrs! 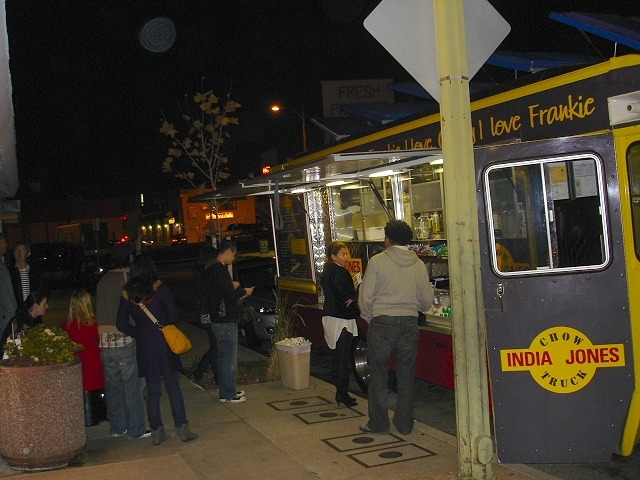 Fans of India Jones Chow Truck waiting for some Awesome Northern Indian Cuisine. 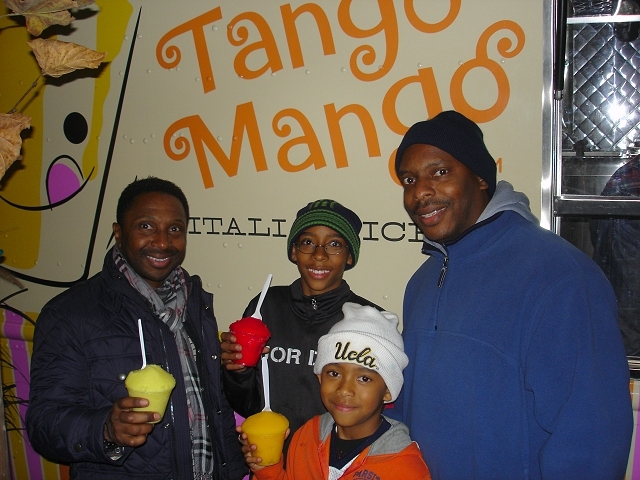 Art Beckham (LF) from Tango Mango with his brother and nephews enjoying some delicious ices. Michael of the Hungry Nomad truck enjoying a profitable night thanks to the great turnout.